Norton Creek Press, March, 2003. ISBN 0972177000. 155 pages. Suggested Retail price: Paperback $17.95, Kindle: $5.97. Your Baby Chicks are Helpless—But You Aren’t! For any creature, the first few days and weeks of life are crucial. 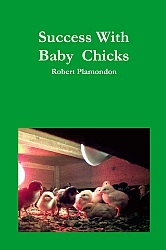 Give your chicks the care they deserve by reading the only book devoted solely to baby chicks. Other books cover the brooding period in just a few pages, but it is too important for that. Both your enjoyment and the welfare of your baby chicks depend on brooding them successfully, every time. In Success With Baby Chicks, I cover everything you need to know about nurturing your baby chicks through the all-important brooding period, which starts when they hatch and ends, weeks later, when they no longer need supplemental heat. 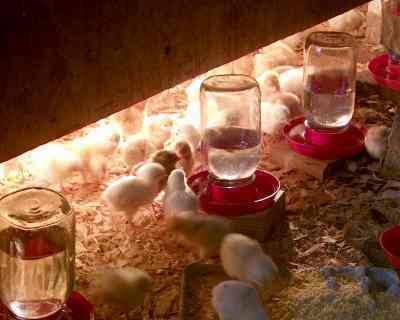 You will learn how to select a hatchery, choose a breed, set up the brooder area, and care for your adorable, helpless, fluffy little baby chicks. All this and more are covered in this easy-to-follow book. Since I got your book “Success with Baby Chicks” my mortality rate in brooding has improved dramatically. We are raising 100 broiler chicks for the first time in the brooder box you outlined in your book and I am just amazed at its simplicity and effectiveness. I have been using the box now for 1 week, and I have lost only 1 chick. I also am currently brooding them with only a 175 watt infared bulb (it has been warm out here). They seem to be very content and are already looking tasty. Thanks for your help. The book is an excellent resource. I spent years researching and testing these techniques on my free-range farm in Oregon. I read over a hundred books on poultrykeeping at Oregon State University’s Valley Library, and surveyed a hundred years of poultry journals and magazines. It seems to have worked! Not only do my own chicks do well, but the book has been getting rave reviews since it came out. Not just from beginners, but from experienced poultrykeepers as well. Some highlights include an easy-to-build insulated brooder that will keep your chicks warmer while cutting your electric bill by two-thirds, how to brood chicks confidently in mid-winter, and exactly how you will go about feeding baby chicks. Many of the techniques in this book were commonplace in our grandparents’ generation, but were gradually forgotten after the switch to factory farming. My survey of a hundred years of poultrykeeping has restored much that had been lost. You will avoid disaster and ensure a pleasant, successful experience when you buy this book today. For best results, read it before you get your baby chicks! Overhead infrared heat-lamp brooding has a chapter to itself. I cover these details because, with baby chicks, details are important. The issue isn’t that ignorance makes you less efficient, but that the baby chicks suffer. Read my book and this will never happen to you again. My book is a real bargain. A good hen will lay at least $50 worth of eggs, even if you only value them at supermarket prices. If my $15.95 books saves only one pullet chick, it repays itself three times over! And when you use my techniques, you will do far better than this, time after time, year after year. Like many people, I used to have a good baby-chick experience one time and a bad baby-chick experience the next. There didn’t seem to be any pattern to it. It was very frustrating, and it made me shy away from raising as many chicks as I wanted. I had gone into free-range egg production almost by accident, and I was never going to get anywhere unless brooding chicks went from a dreaded chore to a high point of the year. Baby chicks are such a joy when things go well, but never knowing whether your baby chicks are going to live or die casts a pall of uncertainty and gloom over any poultry operation. No one can enjoy poultrykeeping if their flocks suffer from high mortality. And I don’t even want to think about the effect it has on kids, who go into a poultry project brimming with optimism. How can this be avoided? I had the good luck to meet a retired lady who had raised 30,000 chicks a year for many years, and insisted that raising chicks can be done with almost perfect success on any scale. She claimed she lost 1% of the chicks during the first week (from shipping-related stress), and the rest all survived to maturity. Bold claims, but she wasn’t the only one to report such results! You will benefit from my research. I have the good fortune to live near Oregon State University, which has hundreds of poultry books and magazines in its library, dating back to before 1900. I flipped through all of them, read most of them, and learned all kinds of things that used to be well known, but are now forgotten. Small farms and small flocks used to be the norm, and agricultural research then as now focused on the mainstream. This means that the literature of 50-100 years ago is filled with tested, proven, practical small-farm poultry techniques. Our grandparents’ generation knew a lot about chickens. First I read about their techniques, then I tried them. Then I read some more. A lot of concepts didn’t sink in all at once, because the information was scattered, and sometimes really crucial ideas were mentioned only in passing. But I kept at it. My results with baby chicks kept getting better and better, and yours will, too. 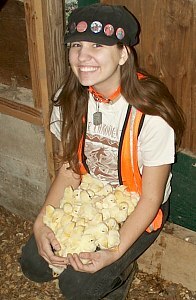 It wasn’t that I had been doing just one or two things wrong with my initial batches of chicks. I had been doing dozens of things wrong! My initial reading of “modern” poultry books hadn’t prepared me. And not only did I lack knowledge about techniques — I didn’t know any of the warning signs of trouble. Things would get really bad before I knew that anything was wrong at all. Here’s an example: I bought 150 pullet chicks in May. When I moved them out of the brooder house on July 2, I had 154 live pullets! Negative mortality! It’s not really a miracle (hatcheries add extra chicks to cover losses in shipping), but “negative mortality” is pretty good by anybody’s standard. And when you buy the book and put my techniques to work,these results will become typical for you, too. Not only do these techniques work better, they can save you money. In Chapters 7 and 8, I tell you how to build an insulated electric brooder in two hours for about $20, which uses only about one-third the amount of electricity as overhead heat lamps, and does a better job besides. It’s an easy construction project that won’t give you any trouble. It uses infrared heat lamps or reflector floodlight bulbs. Many people have told me that this information alone is worth the price of the book. None of these techniques are very complicated. I explain them fully in Success With Baby Chicks. My goal is to give you the same kind of results and understanding in just one book that took me hundreds of books and more than five years to achieve. My goal doesn’t include getting you to buy lots of expensive equipment. Being successful with baby chicks depends on your understanding of the chicks and their needs. The actual equipment and housing requirements are quite basic, and are much the same whether you are brooding ten chicks or a thousand. So buy the book right now! You can’t benefit from its information until you read it. I have a flock of 400 free-range laying hens, and my wife Karen Black raises about 1,000 pastured broilers per year. Our enjoyment of farming and the financial success of our farm depend on raising large numbers of chicks successfully. See our How to Order page. Dungeons & Dragons Back in Fashion?